It can be a stressful and emotional event to lose a tooth. At Dental Link, our Wembley Downs, Sorrento and Doubleview dentists are here to help you replace your missing teeth in the most predictable manner possible. 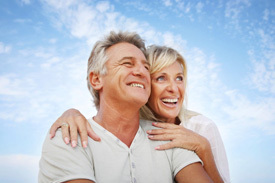 You’ll find that we can help by offering in-house dental implant options. Dental implants can be an amazing treatment option, so how do you know if you’re the right candidate? The best way is to book a free dental implant consultation with us! To make the process easier for our patients, we’re offering a complimentary dental implant consultation so you can learn more about this service with no obligation or risk. Terms and conditions apply * Contact us today. Implants are the gold standard of modern tooth replacement. Surgery is performed at our Wembley Downs clinic so there’s no need to refer you elsewhere. Conventional implants are placed surgically with a temporary prosthesis installed over them as your mouth heals. That way you never go without teeth. A bit later on, we will place a permanent crown or bridge over the implant(s). The results are aesthetically pleasing and the most natural looking type of tooth replacement that we offer. Do you need to replace all of your teeth at one time? A full denture can be anchored directly over implants in just one day. The All-on-4 concepts are perfect for people who want to avoid multiple visits and are looking to replace missing teeth, broken or worn broken teeth or an ill-fitting loose denture. Our dentists will use a series of 3D dental Cat scans to plan the surgical placement of each artificial tooth root. We will also use a series of photographs and study models to plan your treatment before the surgery is started. Replace your missing teeth to avoid embarrassment or before other teeth shift out of place. Implants are designed to mimic your natural teeth more closely than any other type of modern tooth replacement available. Schedule a free consultation * with one of our dentists to find out if they are right for you. Financing plans are available for your convenience. Contact us today. *Terms and conditions apply. There may be recommendations for x-rays, photos, or other diagnostic records that need to be obtained before a fully informed opinion can be offered. These items may also attract a fee. All fees and charges will be fully explained during the initial free consultation and the consultation is a no obligations opinion only. Any surgical or invasive procedure carries risks. Before proceeding, you should seek a second opinion from an appropriately qualified health practitioner.